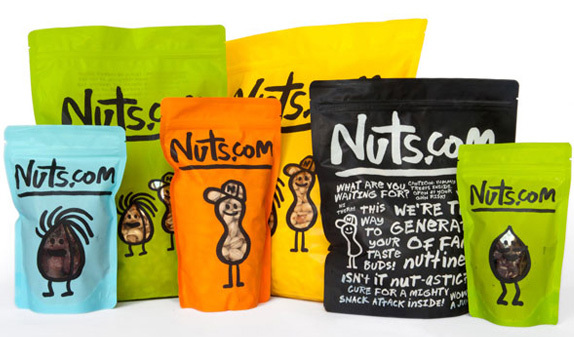 Launched in 1999 as NutsOnline and based on a family business dating back to 1929, the newly named Nuts.com is an online retailer of more than 200 varieties and treatments of nuts as well as dried fruit, snacks, chocolate, and coffee and tea. 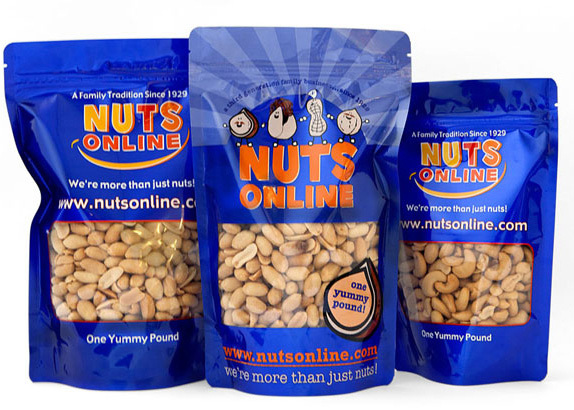 Based in New Jersey, Nuts.com has a 60,000-square-foot space and 80 employees. 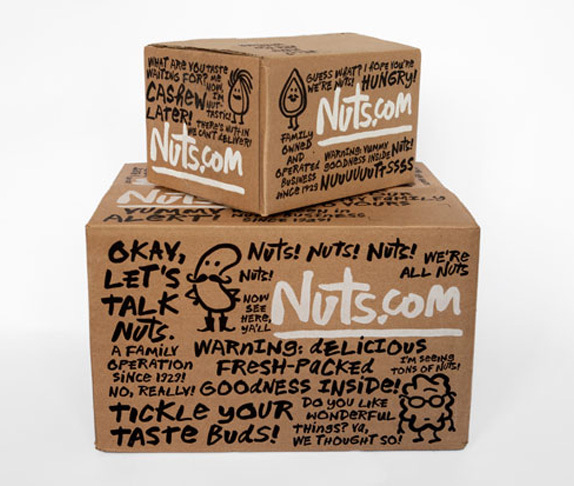 After living at www.nutsonline.com for thirteen years, the company was finally able to purchase www.nuts.com — details here — adopt it as its name, and design a new identity and packaging around it, which was designed by Pentagram partner Michael Bierut, quite literally this time: the logo and type are based on his own hand-drawn alphabet, digitized by Jeremy Mickel. 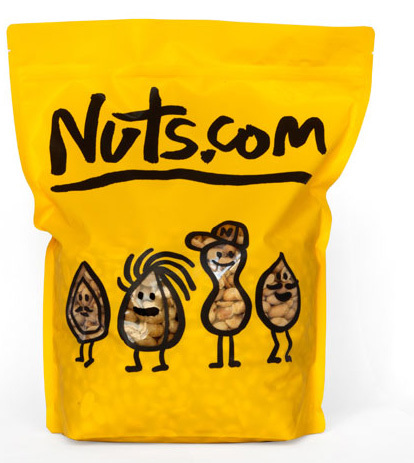 The identity is complemented with nut character illustrations by Christoph Niemann. 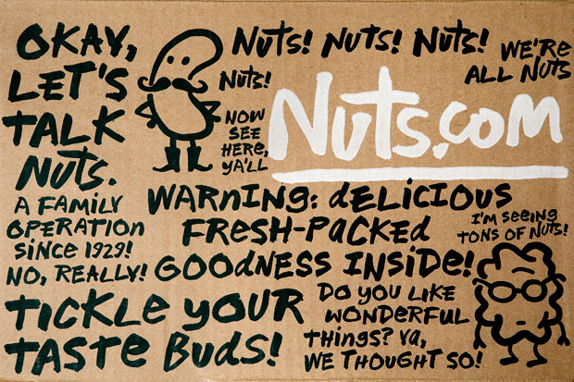 Everything about the previous version of the business felt second-rate: from the name, which is as 1999 as it gets, to the logo to the packaging, all lacked any kind of sophistication. 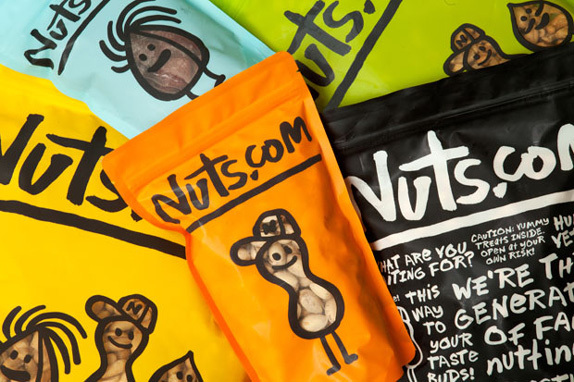 Not that it really mattered, as the business reached annual revenues of more than $20 million, but why not look your best when you have a great business selling one of the greatest food groups in the history of snacks? The new identity and packaging is one of my favorite of the year so far. It’s simple, striking, and fun even though for the most part it’s all based on kind of “dumb” graphics. The logo and hand-drawn alphabet are not particularly the greatest feats of graphic design and Christoph’s mighty nut characters don’t have the conceptual depth of his typical work but, when combined, against texture-free, super bright backgrounds, the whole is crunchier than its parts. Overall, this is one of those projects that demonstrate the potential of identity design to create something that is simply just joyful and, in this particular case, something that creates even more expectation when receiving a package already full of goodness. We are having some issues with our polls. Sorry about the inconvenience. Update: Voting is fixed.